Over the past 75 years, Jeep has built a global reputation for making the world’s most capable off-road vehicles, a heritage and history that’s respected by those who rely on Jeep vehicles from the burning deserts to the arctic wastes. With the 2019 Jeep Cherokee Trailhawk edition, Jeep has hit another home run for those who want to get out there past where the pavement ends and adventure awaits. Want to buy a 2019 Jeep Cherokee Trailhawk in Fayetteville, Arkansas? Then stop in today at McLarty Daniel Chrysler Dodge Jeep Ram Fiat in Springdale. We’ve got the 2019 Jeep Cherokee on the lot, including several Trailhawk models, ready to help you get to the wild country and rewrite this chapter of your own, unique story. Try us soon for a test drive, or check out our big selection of 2019 Jeep Cherokee models online right now. There are 2019 Jeep Cherokee models built for ultimate economy in a beautiful package. There are 2019 Jeep Cherokee models built for ultimate luxury and ride quality to make a great first impression. 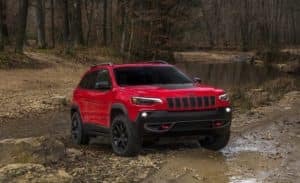 But where it comes to the 2019 Jeep Cherokee model that is built to take on anything Mother Nature can throw at it and keep on going, there’s only one model that will do: the 2019 Jeep Cherokee Trailhawk. Packed inside and out with the toughest, most rugged, most capable equipment found on any 2019 Jeep Cherokee, the Trailhawk can get you out there and back in comfort, safety and style thanks to a combination of bomb proof engineering and legendary Jeep reliability. Outside, the 2019 Jeep Cherokee Trailhawk looks the part of a rough and tough trail bruiser, thanks to a factory lift, Trailhawk-specific alloy wheels with knobby all-terrain tires, a tucked-up front and rear fascia to improve the approach angle, and Trailhawk’s signature red towhooks. Inside, the Jeep Cherokee Trailhawk shows that your don’t have to sacrifice comfort and connectivity when you’re off-roading, with seating for up to five and available creature comforts like leather seating, the UConnect in-dash touchscreen, and the CommandView Panoramic sunroof. The real story of the 2019 Jeep Cherokee Trailhawk, however, is its unstoppable, Trail Rated capability. Jeep’s top-of-the-line off-road package, the 2019 Jeep Cherokee Trailhawk model is tested in the real world, besting sand, mud, snow, ice, deep water and rocks. Standard equipment on the 2019 Jeep Cherokee Trailhawk is Jeep’s rugged Active Drive Lock 4×4 system, which features a mechanical rear-axle lock, a four-wheel drive Low Mode for extra low-speed traction, a crawl ratio of up to 51.2 to 1, and Select-Terrain Management System with a “Rock” mode that optimizes over a dozen engine, transmission and driveline-related systems to deal with the challenges of crawling over slippery rocks as well as sand, mud and snow, all with a flick of the switch located on the interior console. In the 2019 Jeep Cherokee Trailhawk, ford streams and creeks with confidence thanks to a high-mounted air intake and advanced body and electrical sealing that allows you to plow through water up to 19 inches deep. On dry ground, wheels on terra firma mean more traction to help you power through, and the 2019 Jeep Cherokee delivers thanks to a four-corner independent suspension that allows for plentiful suspension articulation in uneven terrain. Powering you through the rough stuff is the available 3.2-liter Pentastar V6, with a robust 271 horsepower and 239 ft.-lbs. of torque, while delivering up to 27 miles per gallon on the highway and towing of up to 4,500 pounds when properly equipped. Heard enough to know that the 2019 Jeep Cherokee Trailhawk is the SUV you need when adventure comes calling? Ready to buy a 2019 Jeep Cherokee Trailhawk in Fayetteville, Arkansas? If so, stop in for a test drive today at McLarty Daniel CDJRF in Springdale, where our 2019 Jeep Cherokee selection is second to none and our low-pressure sales and service after you sign on the dotted line will make you a customer for life! In the meantime, check out our big selection of 2019 Jeep Cherokee models online. 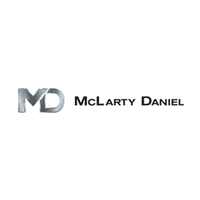 Click here to contact McLarty Daniel CDJRF, or click here to visit out finance center.